I was invited to enter a show at the Ocean City Art Center entitled " The Vanishing Beach Cottage" I spent a few hours driving along Ocean Drive; a scenic route that traverses seaside towns here in Southern-most New Jersey. I saw many cottages, though none on the actual beach. I found this humble little bungalow (on the beach) at 41st street in Ocean City. 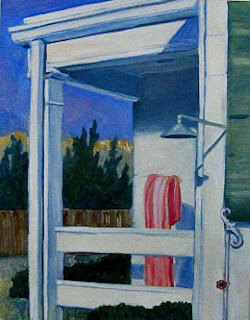 I was really drawn to the outdoor shower right off of the back porch. Outside Shower heads like that really strike a cord with my experiences of being on the beach as a kid. Anyway I took some photos then ran to the store to buy a beach towel, came back and took a few more..I ran out of light, didn't have time to sketch, felt wierd tromping aound on someones property. A neighbor was watching me from across the street with a suspicious glare. Ah the price of art. Here is todays effort with oil on a 9x12 panel. The photo makes the lines off kilter, but they look quite right in real life. Great that you went to buy a towel! I would never have thought of it. Thanks for commenting Bart, it's good to hear from you!